Country Mouse Tales: I'm Baaaaack! Did you even notice I was gone? For over a week? No?! Okay...forget that I even asked that question! In my head I'll pretend you have been losing sleep at night over my absence! I was going to let you know before we left, but recently there have been two families I know in the area whose homes have been burglarized while they were on vacation, and the guess at the time is that the thieves may have learned they were gone from Facebook. Facebook? FACEBOOK. So...I kept our plans on the down-low. 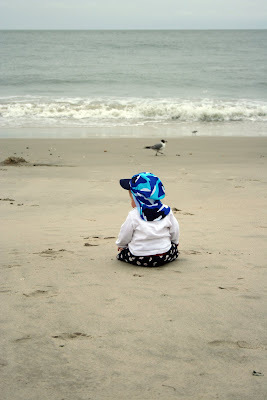 We have just recently returned from a wonderful week in Cape May with my Mom's side of our family! 11 of us in one house, and you know what? It was awesome! It was a large beach house, but still...11 is a lot of people. I think the closeness of our quarters really helped us bond. Did I mention I shared a bathroom with 4 boys? I did. THAT'S an eyeopener. Air freshener boys, air freshener! I took well over 300 photos, but have yet to sort through them...so for now this one will have to do. And if you will excuse me...I have a mountain of sandy laundry to wash.
Glad to hear that you had a great time. 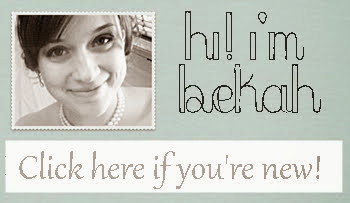 And Bekah, not telling everyone that you are away is a really good thing. Trust me! It is a really good thing. I missed you and I'm glad you're back! love your photo. I feel your pain with the bathroom boys. My daughter is away most of the year now, and I am left with just boys and men in the house....need I say more! Cute pic! Can't wait to see more. Love the photo, glad you had a great holiday!